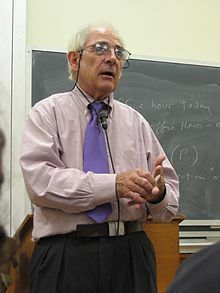 John Rogers Searle (/sɜːrl/; born 31 July 1932) is an American philosopher. He is the Willis S. and Marion Slusser Professor Emeritus of the Philosophy of Mind and Language and Professor of the Graduate School at the University of California, Berkeley. He is known for his contributions to the philosophy of language, philosophy of mind, and social philosophy, he began teaching at UC Berkeley in 1959. This page was last changed on 24 March 2018, at 23:33.